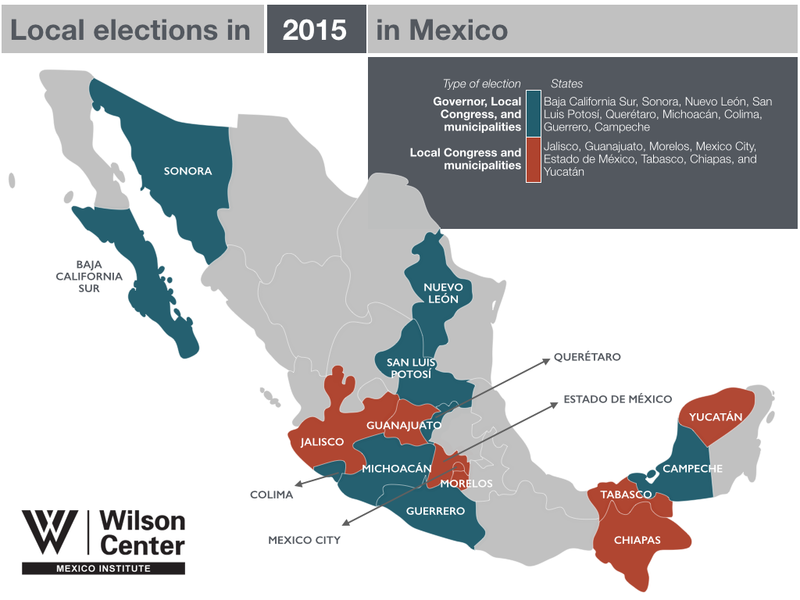 The 2015 election in Mexico is not only about the 500 seats of the Chamber of Deputies, but is also about the local elections that will define the path that many states will follow in the years to come. In total, 17 states will have local elections and Mexicans will have the opportunity to choose more than 1,000 officials throughout the country. To continue the work and discussion on some regulations that may affect the implementation of the reforms, especially the telecommunications and the energy reforms but also some economic laws such as budgetary adjustments and infrastructure projects. To explore the possibility of new agreements with the Executive branch and to advance important agendas, propelled mainly by civil society, but key to the long-term benefit of the country such as transparency, rule of law, and the fight against corruption. 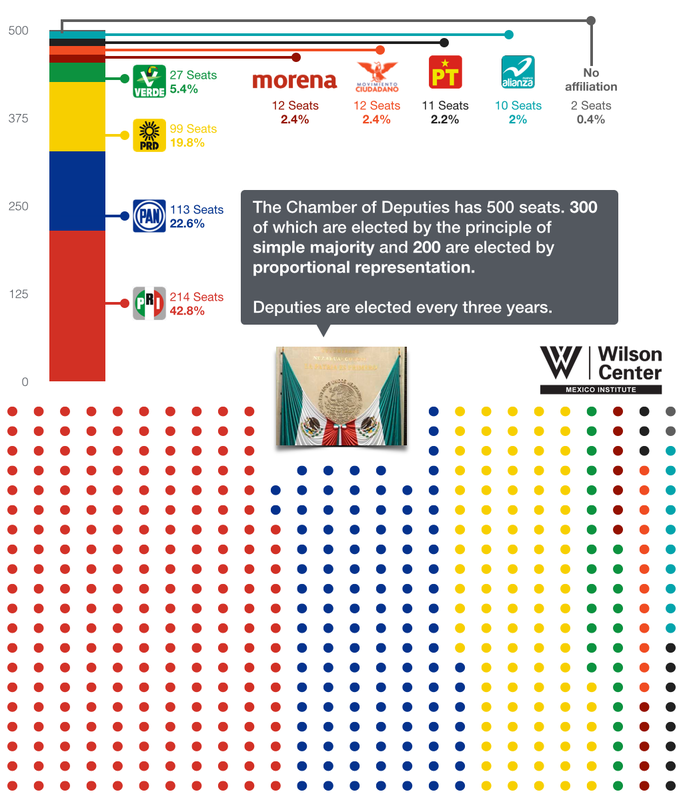 Currently, as shown in the figure below, the PRI (42.8%) is the party with the largest representation in Congress and if it adds the votes of frequent allies such as PVEM (5.4%) and PANAL (2%), they can achieve a slight majority with 251 votes (50.2%). The PAN has a representation of 113 seats (22.6%), a situation that has allowed it to become a key actor to pass bills for which a qualified majority is needed. On the other hand, the left forces, led by the PRD (19.6%) could have an important block when they manage to coordinate efforts. This block is potentially formed by the PRD plus MORENA (2.4%), MC (2.4%) and PT (2.2 %), achieving a total of 134 votes (26.6%). The governor most noteworthy, for the political and for the economic weight that the state has, is Nuevo León, where a close competition between the PRI, which currently governs, and the PAN is expected. The list to renew governorships includes Michoacán and Guerrero, whose head is currently interim in both cases. In the first case, the interim head was derived from the resignation (due to health reasons) of the originally-elected governor, but was accentuated by violence and the so-called self-defense groups. In fact, until less than two months ago, a Federal Commissioner was in charge of some security and financial strategies to help the state. Furthermore, the situation aggravated as the previous acting governor, among other politicians from the state, have been accused of alleged links to drug-trafficking organizations. The last election was won by the PRI, but this time the fight will be very close among the PRI, PAN, and PRD. In the second case, the governor, who had been elected by the PRD, was forced to resign as a result of the disappearance of the 43 students from Ayotzinapa last September. Since then, not many changes have occurred in the state, and more and more voices from the society are calling for the cancellation or postponement of the elections in that latitude. In conclusion, both states are being affected by violence and social protests, which put in danger not only the election day, but also the legitimacy and leeway with which the new officials will arrive to govern. Other states that will renew their Executive branches, and where it appears that the competition will be close, are: Sonora, Querétaro, and San Luis Potosí. The first is currently governed by the PAN and the other two by the PRI. 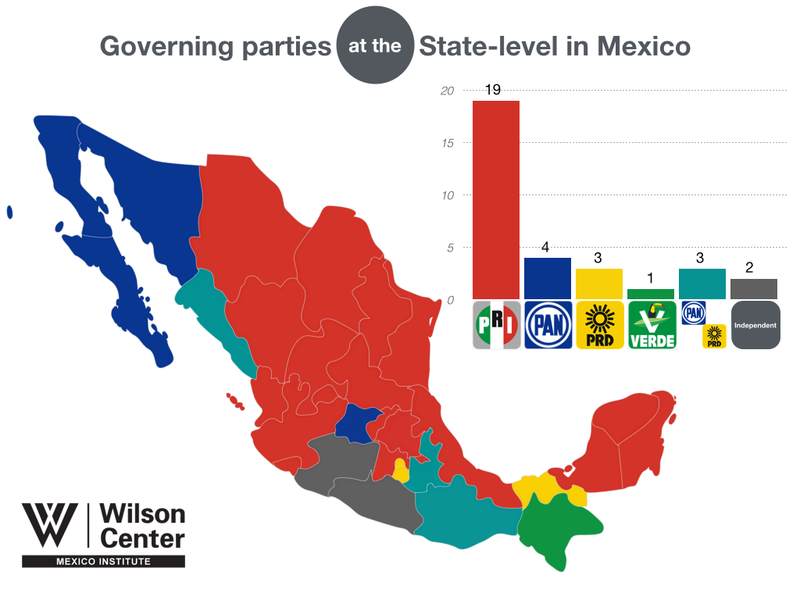 The list of states to elect a new governor finishes with Baja California Sur, Campeche, and Colima; in which the respective parties in government (in the first case PAN, PRI in the other two) are challenged to establish themselves as the leading political forces in each place against strong opposition parties. Certainly the most important electoral battle will be in Mexico City, where leftist forces, mainly MORENA and PRD, will be battling for important positions in the city. The influence of that fight could affect nearby states such as Michoacán, Guerrero, Morelos, and Estado de México. Other key states that will renew local authorities are Jalisco, Guanajuato, and Estado de México, where a little over 30 million Mexicans live. These states are consistently key for the federal elections. Especially important is Estado de México for its influence in the country’s south-center and for being the state of origin of President Enrique Peña Nieto. The list is completed with the states of Tabasco, Chiapas, and Yucatán. In the first case, the challenge is enormous, as Tabasco is the state of origin of Andrés Manuel López Obrador and has been characterized in recent years for being an electoral stronghold of the PRD. In the second case, the PVEM has the challenge of preserving, in partnership or alone, a good political influence in the first-ever state governed by that party. Finally, in the third case, electoral competition will likely be close between PRI and PAN for the control of local legislature and Mérida, the capital of the state.